Linda Burton posting from Madison, Wisconsin – It must be true. I’ve always heard that Wisconsin is the place for cheese, and today I looked for signs of that as I drove from Saint Paul to Madison. 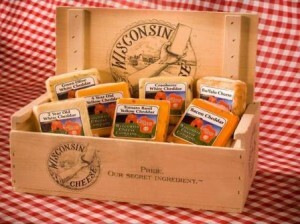 Signs I saw, all urging me to shop; Cheese Alley, Cheese Chalet, Mousehouse. But I didn’t stop; the heat that’s been sitting on top of the northern states like a steam-pot dome was in its fifth day and I couldn’t leave the cats in the car; even a quick-stop for gas was almost too long to have the cooler off. I parked the car under a tree last night; it was shaded from the early morning sun as I loaded up this morning but the humidity knew no bounds; by the time I brought the cats out I was soaking wet. “Water!” I said, gulping down half a bottle of Aquafina before hitting the freeway. It wasn’t the best of drives. Since I was headed east, the morning sun was a glare. The windshield was buggy from earlier hits; I hadn’t taken the time to scrub it down before I left. There isn’t much of Minnesota before you get to the St Croix River, a tributary of the Mississippi; and zap, once you’re across you are in Wisconsin. I snapped a photo of my rather inauspicious entry, but it can never achieve more than “token photo” status; you see the bugs on the windshield and the glaring morning sun; the “Wisconsin Welcomes You” sign was half-hidden in the shade. 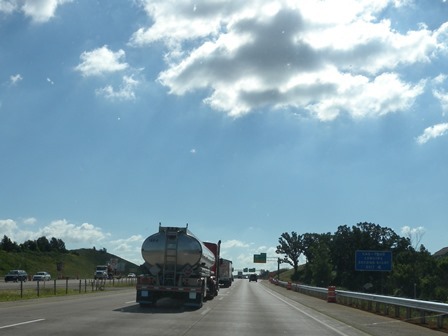 “You’re Wisconsin cats now,” I announced anyhow; as tanker trucks zoomed by, seemingly oblivious to the orange cones, and the swerving lane changes as we passed through endless construction zones. I settled in the right-hand lane, looking for dairy farms, and looking for cheese. Farms I saw, but nary a cow. Corn I saw too, it has passed knee-high growth and stands about waist-high now in very healthy-looking fields. Wherever the cows are, Wisconsin does in fact lead the nation in cheese production; and ranks second (after California) in milk and butter production. It surprised me to learn that half of the national cranberry crop grows in Wisconsin; in fact, it ranks first in cranberries, ginseng, and snap beans! The cranberry is Wisconsin’s official state fruit; it has been growing here since 1860 and now grows in about 20 counties in central and northern Wisconsin. 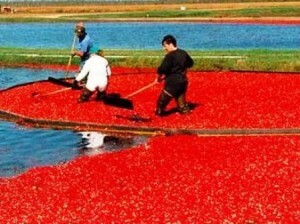 Did you think cranberries grow in water? I did, thanks to those TV commercials where the men are hip-deep in floating berries. Actually they grow on low-trailing vines in sandy or peat marshes, but the commercials are correct – when it’s harvest time, the marshes are flooded. The tiny berries, you see, have a pocket of air inside; they float right to the surface ready to be picked up by the harvesting equipment. Here are two interesting cranberry factoids for you: (1) the cranberry was originally called the “crane berry” because its blossom resembles the sandhill crane, and (2) Wisconsin grows enough cranberries each year to supply every man, woman and child in the world with 26 cranberries. Get out your cup! Cranberry Harvest Tours are a big part of autumn in Wisconsin; near the Warrens exit I passed signs advertising such; the Warrens Cranberry Festival in September is the state’s oldest and largest; in addition to marsh tours there are food booths and farmers markets and biggest berry contests. 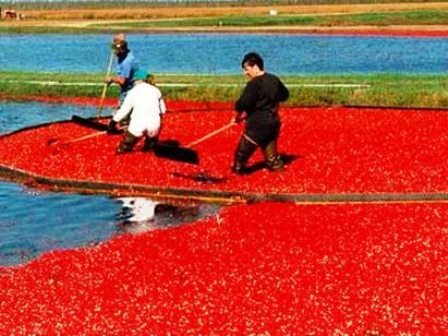 Manitowish Waters Colorama, Stone Lake Cranberry Festival, and the Eagle River Cranberry Festival are other autumn events; the Wisconsin Rapids Cranberry Blossom Festival in June is all about the beginning of the process. And any time of the year you can drive the 50-mile Cranberry Highway through central Wisconsin, it stretches from Wisconsin Rapids to Warrens. 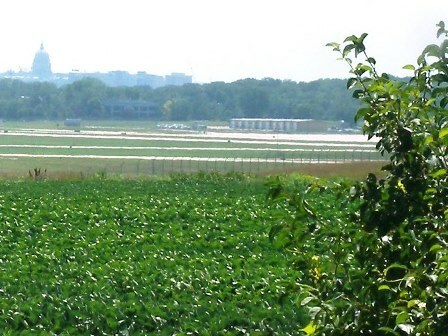 About ginseng; almost 100% of all ginseng grown in America is grown is Wisconsin and 95% of that in Marathon County, which produces about 10% of the world’s supply. It all started with the Fromm brothers from the township of Hamburg in 1904; they transplanted 100 wild ginseng plants from nearby forests onto a plot of their land and carefully duplicated the natural growing conditions. 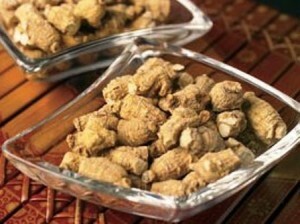 Today most ginseng is exported to Hong Kong and then redistributed to other locations in the Far East; ginseng is a key ingredient used in traditional Chinese medicine. 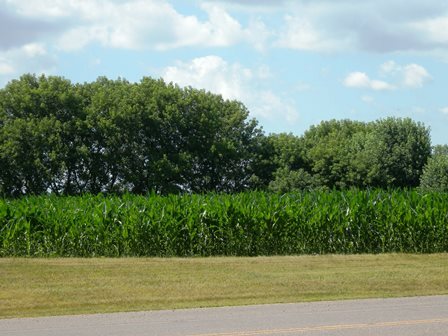 About those green beans; I learned there is a Del Monte processing plant in Plover, and that green bean fields stretch to the horizon there. I’d love to drive a “Green Bean Highway” and watch the harvesting too; processing takes place from late June through the first week of October and beans are canned within 24 hours of harvest. What I did see on today’s drive, in addition to all the growing fields, were the tourist draws; tourism is the state’s third largest industry. 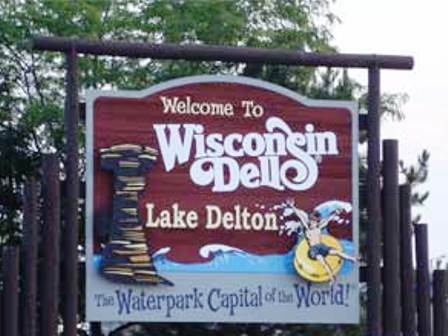 Some of the biggie destination spots are House on the Rock near Spring Green, Circus World Museum in Baraboo, and the famous Wisconsin Dells, Waterpark Capital of the World; more about those in a later post. The Oshkosh Airshow draws hundreds of thousands of visitors annually; the distinctive Door Peninsula is a destination for boaters because of the large number of natural harbors on Green Bay. Coming south on I-94 I passed signs to Bruce Mound, Cascade Mountain and David’s Head ski areas; I spotted Great Wolf Lodge, Three Bears Lodge, and even Yogi Bear waving from a Jellystone Park campsite sign. All interspersed with Christmas tree farms! 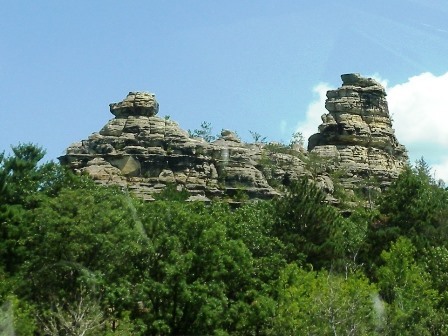 I passed tall freestanding rock formations to my left, marshy bogs to my right, and thick forests everywhere; about half the state is forested. 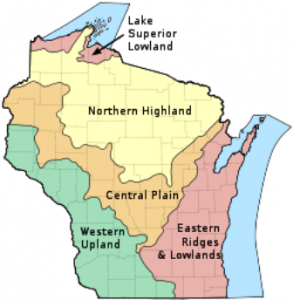 That’s right; this Dairyland State has five distinct geographical regions; the Western Upland is a rugged landscape with a mix of forest and farmland, including many bluffs on the Mississippi River. The Northern Highland is the forested land, with thousands of glacial lakes; in the middle Central Plain are unique sandstone formations and rich farmland; the far north is the Lake Superior Lowland; and the Eastern Ridges and Lowlands are where most of the larger cities are located, like Milwaukee and Madison. My drive ended at the 267-mile mark after the treat of an ever-changing landscape; the heat was still oppressive but even though the drive started badly I was eventually cheered by what I saw; and further cheered on arrival by an unexpected three-room suite. After a hasty unload, the cats and I settled into our cool space, ready to be “home” for a while. So here I am in Madison, Wisconsin, my 37th stop; armed with literature about this 15th largest capital city, population 233,209 (US 2010 Census). I know already it’s called the City of Lakes, and the biggies are the University of Wisconsin and state government. I caught my first glimpse of the capitol dome from the outskirts of town at the edge of the airport, looking across a bright green growing field. 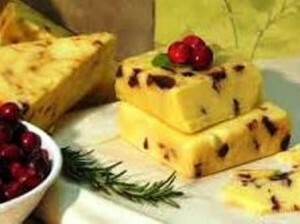 As for the cheese, I’ll keep looking, stay tuned.